With a line-up hampered by injuries, BU closed out first semester by defeating Dartmouth, 4-1, at Agganis Arena to gain its first out-of-conference win. Terriers received goals from Cam Crotty, Patrick Harper, Ty Amonte and Joel Farabee. Crotty had begun the day in British Columbia where he’d been attending Canada’s World Junior Championships camp along with Shane Bowers. Cut from the roster, the sophomore blueliner flew across the continent, arriving at Logan Airport just in time to suit up for last night’s game. Missing from the BU line-up due to injuries were Bobo Carpenter, Chad Krys and Jake Wise, along with Bowers. Crotty gave BU an early first-period lead on a strong move through the right circle after taking a pass from Patrick Curry. He backhanded a shot past Big Green goalie Adrian Clark with Jack DeBoeralso assisting. Midway through the second period, Dartmouth tied the score, converting a 2-on-1 rush with Cam Strong beating Jake Oettinger from the slot, high to the stick side. Just a minute later, Harper stripped a Big Green defender, broke in alone and slid the puck past Clark for the eventual game-winner and his much-awaited first goal of the season. 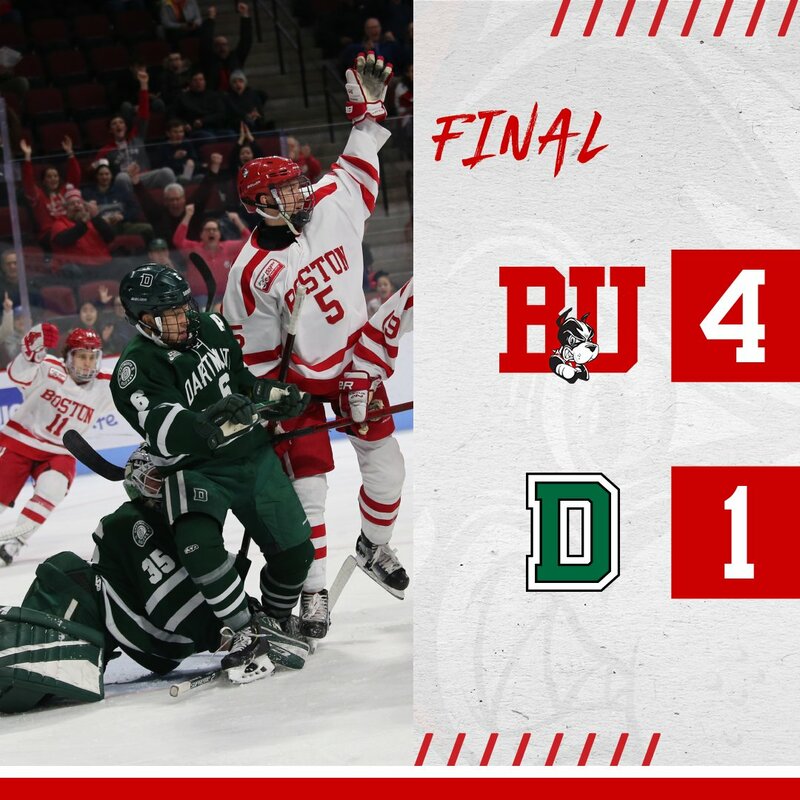 Aided by a BU penalty for too many men on the ice, Dartmouth outshot the Terriers, 13 to seven in the final period, but it was the home team that found the net. Late in the third, Harper set up Amonte for a one-timer from the bottom of the left circle for the sophomore center’s fourth goal of the season, all coming in the past seven games. David Farrance also picked up an assist. Farabee closed out the scoring with an empty-netter, assisted by Max Willman and Matthew Quercia. Oettinger, who turned aside 33 Dartmouth shots, continued his strong play and has held opponents to two or fewer goals in nine of his past 11 games. 2020 recruit Dylan Peterson, a 6’4” forward, scored a goal and added an assist as the NTDP U17s defeated Russia, 4-2, in the Four Nations Cup in Plymouth, Michigan. 2019 recruit Ethan Phillips scored his fourth goal of the season as the Sioux Falls Stampede defeated the Green Bay Gamblers, 5-2 on Friday night. The 5'9" forward from Nova Scotia is now tied for fifth (with projected #1 overall 2019 NHL draft pick Jack Hughes) in USHL points-per-game with 1.50. 2020 recruit Tyler Boucher, a power forward the son of NHL goalie Brian Boucher, is in his first season at Avon Old Farms, where Patrick Harper and 2019 recruit Trevor Zegras starred. Red-hot Alex Chiasson scored his career-high 14th goal in Edmonton’s 4-1 defeat of the Flyers. Chiasson’s 30.4 shooting percentage is second best in the NHL for skaters who’ve played more than ten games.